The Relativistic Heavy Ion Collider or RHIC is a large particle accelerator which collides protons and ions. 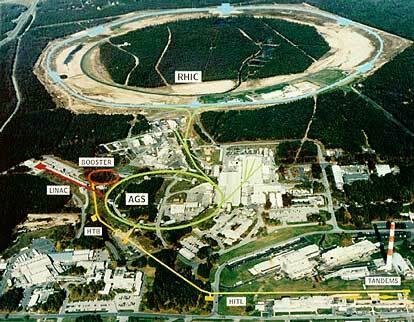 It is located at the Brookhaven National Lab, in Long Island, NY. RHIC circumference is 3.8 km. Its diamter is 1.2 km. RHIC can study particles generated from p+p collisions but its main focus is on the study of heavy ion collision at high energy. Gold (Au, Z = 79) ions are used. Top energy is 200 GeV. Four experiments (STAR, PHENIX, PHOBOS, BRAHMS) look for signatures of quark gluon plasma formation and try to glean insights from enormous amount of data.